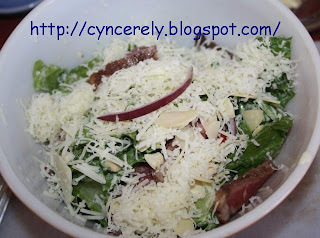 Cyncerely yours: Cesear Salad - an old classic, with a different twist. Cesear Salad - an old classic, with a different twist. Yep. Its official, back on the salad kick. So I'll be posting salad recipes (probably - depending on my ability to get my hands on salad lol!) for the next little while! Here's the deal. I like cheese. I like meat. I like salad. I like almonds. I like croutons, but they are fattening (I said the F-word. omgosh!) I like ceasar dressing, and refuse to compromise on taste/quality (that's where the cals add up!) And I don't eat bacon. So, basically, we'll have salad, with ceasar dressing. I've been told this is very good, and very filling. (that was when I made it with croutons... :) you can use croutons, if you like. I use Romaine lettuce, and unlike a "real" restaurant who think you have a shovel for a mouth, I cut it in BITE SIZE pieces. Nothing gets my goat (baaaaa!) more than eating salad that is in HUGE chunks. I use Romaine for 2 reasons. Apparently, it has more nutrients than head lettuce, and if you get it fresh (and if its from the garden, when it hasn't bolted yet), then its actually pretty tasty. The other reason is, its the only salad my dad will digest (come to think of it, me too... at times). about 8 leaves of romaine lettuce (this was about 150g for me), cut in bite size piece. IF you are eating it right away, you CAN use a metal knife, if you are making the salad for later, use a plastic salad knife. 115g blade steak, sliced thin and in bite size pieces. Chop salad, put in bowl. Add onions, other veggies, mix well. Add salad dressing, mix well so that all veggies are covered. Add steak (or meat(s)) on top, mix gently. Add cheeses and almonds, mix VERY VERY gently. Serve, and devour! I'll have pics up shortly. Enjoy!